To mark International Clinical Trials Day (20 May) Lady Elsie joined researchers and patients at the Northern Centre for Cancer Care (NCCC), Freeman Hospital, Newcastle, to celebrate the benefits of charities, Newcastle University and the Newcastle NHS Foundation Trust working together as a team. Together, this partnership, called the Newcastle Cancer Centre, is helping develop vital drugs for cancer patients in the North East and Cumbria. One of the drugs being tested in the Sir Bobby Robson Cancer Trials Research Centre at the NCCC is Rucaparib, which is giving patients with terminal cancer a ‘lifeline’. It is a type of drug known as a PARP inhibitor and Rucaparib was initially developed in a collaboration between Newcastle University and Cancer Research UK. PARP inhibitors are targeted treatments that kill cancer cells, while leaving healthy cells relatively unscathed. PARP is an enzyme that helps damaged cells to repair themselves. If PARP is blocked, cancer cells may not be able to repair themselves. Cancer Research UK-funded researchers at the Newcastle Cancer Centre have played a pivotal role in the development of PARP Inhibitors and the first cancer patient in the world to be given this new type of drug was treated in Newcastle in 2003. Now, 12 years on, work on this drug is continuing with current trials open in ovarian, breast and pancreatic cancer and it is likely other cancer types may also benefit. Professor Ruth Plummer is a Cancer Research UK clinician at the Northern Institute for Cancer Research in Newcastle. She is also Director of the Sir Bobby Robson Cancer Research Trials Centre, treated Sir Bobby Robson and is a Trustee of his charity. Professor Plummer says: “Rucaparib is actually the very first PARP inhibitor to be given to patients and it’s one of an exciting new class of drugs. 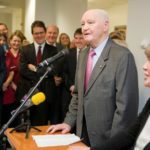 The Sir Bobby Robson Cancer Trials Research Centre was equipped by the Sir Bobby Robson Foundation and the charity also funds posts of a clinical trials doctor and nurse within it. Clinical trials of Rucaparib are being carried out on people who have solid tumours that have grown into surrounding tissue or spread to another part of the body and is otherwise untreatable. Jean Vipond from Darlington, 69, was diagnosed with ovarian cancer in 2008 and in 2012 she was given the devastating news that her cancer was terminal. The retired mother of two, and grandmother of two, was given the opportunity to take part in a clinical trial for Rucaparib, which she describes as a ‘lifeline’. She has been receiving treatment at the Sir Bobby Centre since February 2012 and credits the team there, and the drug trial, for extending her life. Jean says: “I was diagnosed in 2008 and had various treatments over the next four years. Then in January 2012 I went to see the oncologist and was told there was nothing else they could do and I only had a few months left. “A trial was the only thing I could try and I got an appointment to come to the Sir Bobby Centre and I was offered this drug. “It’s three and bit years later now. It’s brilliant. The tumour is still there but the drug is hopefully still keeping it in check. “It’s so devastating a diagnosis and you just want to carry on living your life as best you can, for as long as you can. I can still go away on holiday and just try to live life to the full. The development of Rucaparib is just one benefit to be gained from the partnership work of the Newcastle Cancer Centre. Launched in July 2009, the Newcastle Cancer Centre at the Northern Institute for Cancer Research (NICR) is a collaboration between Cancer Research UK, North of England Children’s Cancer Research Fund, Newcastle University and Newcastle upon Tyne Hospitals NHS Foundation Trust and, since 2013, the Sir Bobby Robson Foundation. The Sir Bobby Robson Foundation benefits from working in partnership with Newcastle’s other leading cancer organisations and this helps reduce any duplication of work meaning charitable funds can go even further. Professor Plummer adds: “This partnership is an exciting opportunity to bring even closer the NHS Trust, University and local charities, all working together to bring better and innovative treatments for cancer patients. “Effective teamwork was very important to Sir Bobby during his football career and it was something he was equally committed to when he launched his charity too. By promoting collaboration between scientists, doctors, nurses and funding organisations, the Centre aims to speed the delivery of new therapies like Rucaparib and improve cancer services in the area. Sir Bobby Robson undertook a clinical trial of a new cancer drug and was very positive about the process. Today, Lady Elsie met with Jean and discussed the drug trials in the Sir Bobby Robson Centre. Lady Elsie says: “Everyone working together like this is marvellous really. It’s such an effective way to get new cancer treatments to patients quickly. And that’s so important. “It was a pleasure to meet Jean and her husband John, and to chat about her treatment. She’s wonderfully positive about things. * These interactive activities include the ‘chocolate randomisation game’ where the public are randomised into one of two trials depending on the chocolate they pick. Also a ‘genetic taste test’ where the public are tested for ability to taste bitterness. This test demonstrates how individual we all are because of our genes and how important it is that researchers are able to develop individual and personalised treatments for patients, which are then taken into clinical trials.